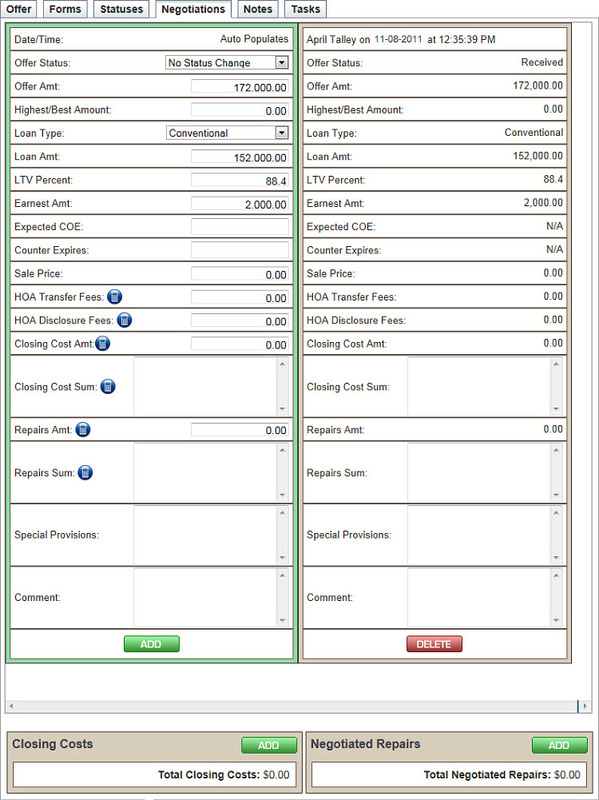 The Negotiations tab is a useful tool for updating and tracking offer information. By keeping the Negotiations tab up-to-date, you can snapshot offer changes as they occur, and track your offer history. The screen below will appear, always showing two or more panes. The pane at left, outlined in green, is there for you to make desired changes to the current offer. The pane at right shows the offer's current information. Each time a change is added, the previous pane will slide to the right, creating a history trail of all offer changes. To save a change made to the pane outlined in green, you must click the green Add button at the bottom of the offer screen. Any undesired panes can be deleted by clicking the red Delete button at the bottom of that pane. You will notice that there are a number of Calculate buttons throughout the Negotiations tab. By clicking these buttons you can extract cost or summary information stored in the related fields, adding this information into the offer. To save this information into the offer permanently, click the Add button at the bottom of the Negotiations screen.